Former President of the Senate, Senator David Mark has for the umpteenth time told Faithful of the Peoples Democratic Party (PDP) to the Saturday’s elective Convention to allow the will of the people prevail and restore the dignity of the Party. Senator Mark in a message to the delegates, urged them to shun those ills such as imposition of candidates and impunity that ruined the chances of the Party in the previous elections. Senator Mark stressed that “we have seen what the imposition of candidates caused us in the past. We cannot travel the same route anymore. “I am sure we have learnt some useful lessons from our electoral misfortune in 2015. We now have the opportunity to right the wrongs of the past by allowing the will of the people to prevail at the convention”. 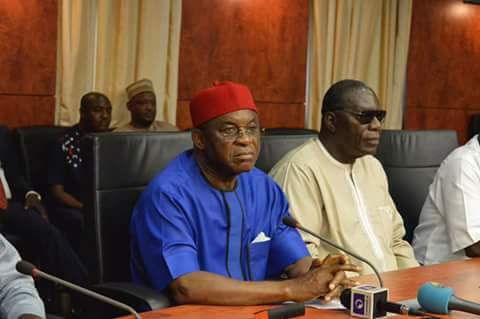 The former Senate President expressed confidence in the Governor Ifeanyi Okowa led National Convention Committee to do a good job and return the Party to the people. Senator Mark enjoined Party Faithful to adhere to the rules of the game in order to guarantee a smooth Convention “because only the rule of law and adherence to the principle of Democracy endures”. He advised the would-be winners and losers to accept the outcome of the elections in the interest of all, saying, “Win or lose, we are still one family. All we need to do is put our house in order in the interest of the Party and its members because I can see a bright future”. He welcomed the former Vice President Atiku Abubakar and others back to the party just as he enjoined all those who defected to return home because “PDP is still the only National Party and a home for all”.